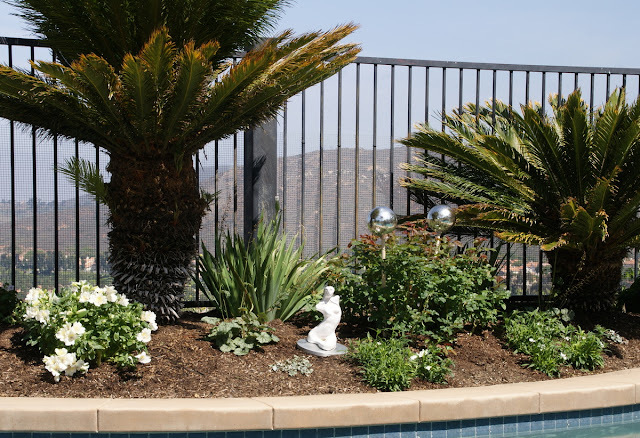 This month I didn't do many new plantings in the White Garden Bed, since I was very busy working in other parts of the garden. In general at this time of the year maintenance already occupies the biggest chunk of my garden time (gosh, how I wish I had more of that! 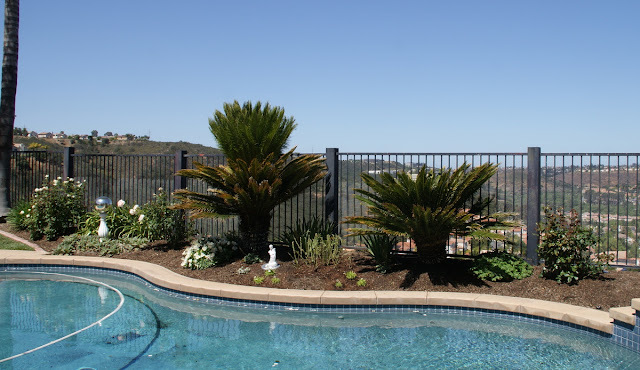 ), so planting new plants takes a back seat. Nonetheless I planted six more white flowering dianthus 'Floral Lace White'. 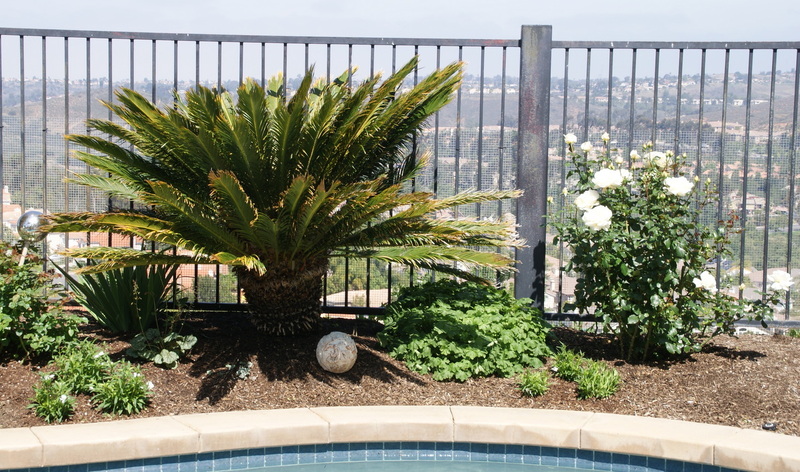 Besides that I cut back one layer of fronds on the left cycad and weeded the bed thoroughly. Other than that I just enjoyed seeing the plants grow and bloom. 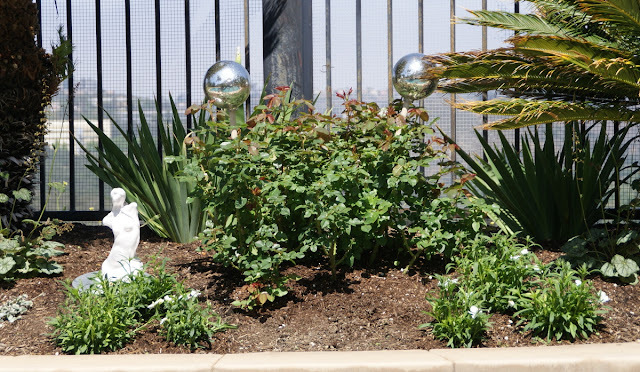 To support my white gray/silver color scheme in this bed I placed a white terracotta sphere, that I previously had positioned elsewhere in the garden. I also put two new silver garden glass balls on wooden dowel rods and stuck them into 'Moonstone', the Hybrid Tea rose that takes center stage in this bed, to add a little bit more interest. 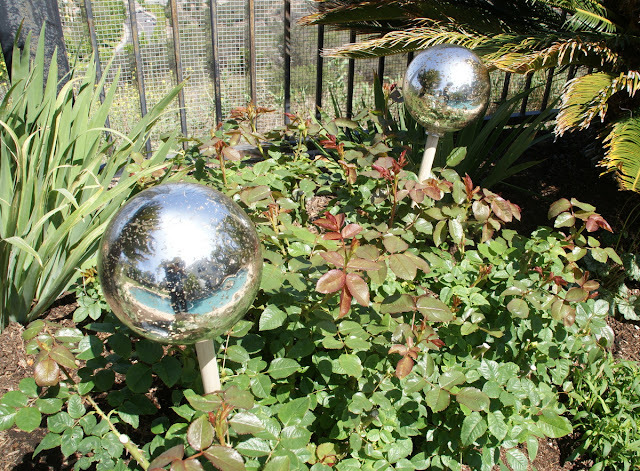 I bought the silver garden balls, they are called Rosenkugeln (rose balls) in German, together with my mother when I was visiting her in Germany last year and, because of the memories that are attached to them, they are very special to me. 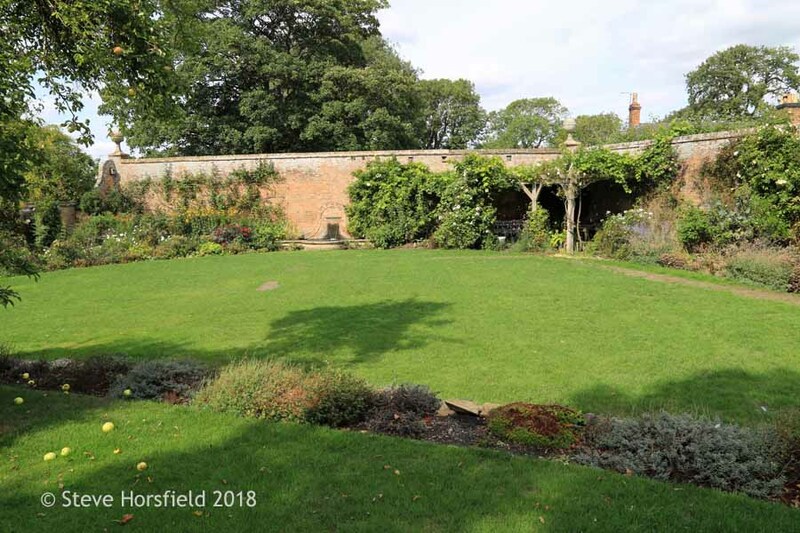 If you compare the photo from May to the one from April the White Garden Bed has filled out nicely, especially in the center. The teeny-tiny dianthus plants in the middle in the front of the bed have grown quite a bit. 'Moonstone', the rose in the center of the bed, which I had to defoliate last month because of a severe infestation with rose rust, has leaved out again. Here is a closer look at the middle section of the bed. To my own surprise after deleaving 'Moonstone', the new foliage came back completely healthy and the rose has now set plenty of buds. I am really in love with these glass balls. They have an interesting finish which reminds me a bit of glass Christmas ornaments and it might be the same technique in which they are produced. They echo the silver gazing ball that is positioned on a white column more to the left of the bed. Here is the second view that I always show in my End of the Month View post. I am quite happy with the way this part of the bed looks in comparison to last month. There is still more soil to see than I would like to, but I am working on that. 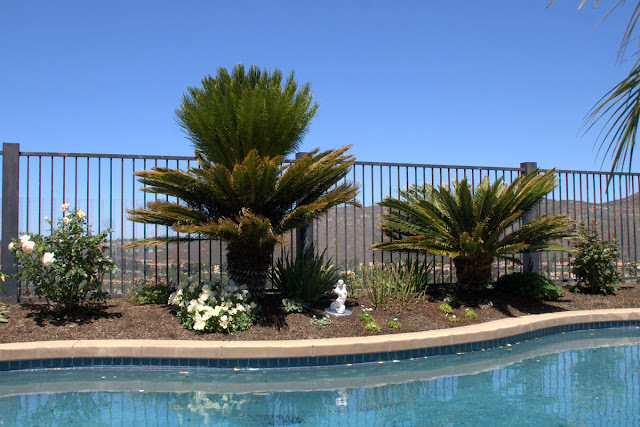 By the way, alstroemeria Princess Lilies 'Claire', the plant in front of the left cycad, blooms profusely since two months now! It has given me so much joy already and I am so very happy that I purchased it in the first place! This picture shows the white terracotta sphere a little better. It has a nice ornamental surface, but could use a new coat of paint. 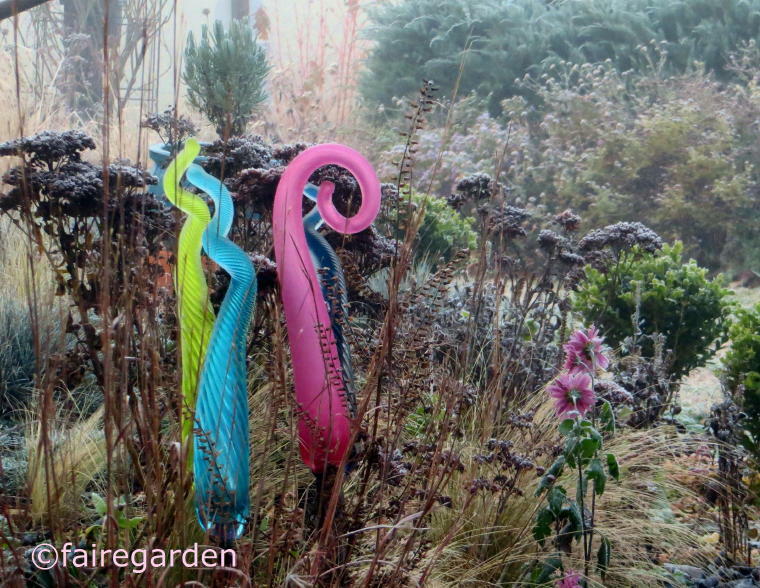 One more item to put on the garden to-do-list. The plant next to it to the right is geranium 'Biokovo', which has really bulked up in the last couple of months. I am a little bit concerned about the cycad. 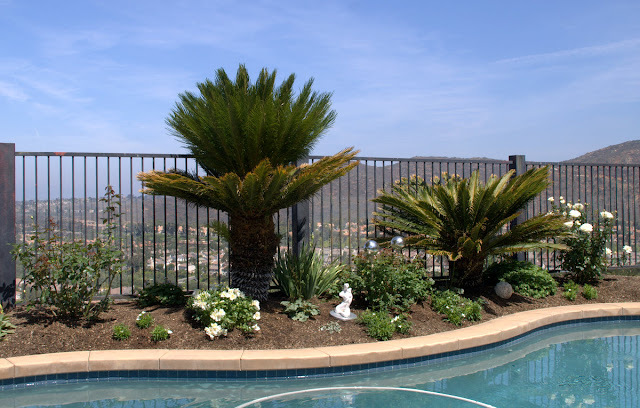 It has made a new layer of fronds, but they seem to be smaller in terms of the length and size than usual and so far they don't unfold properly. Hopefully that will still happen. 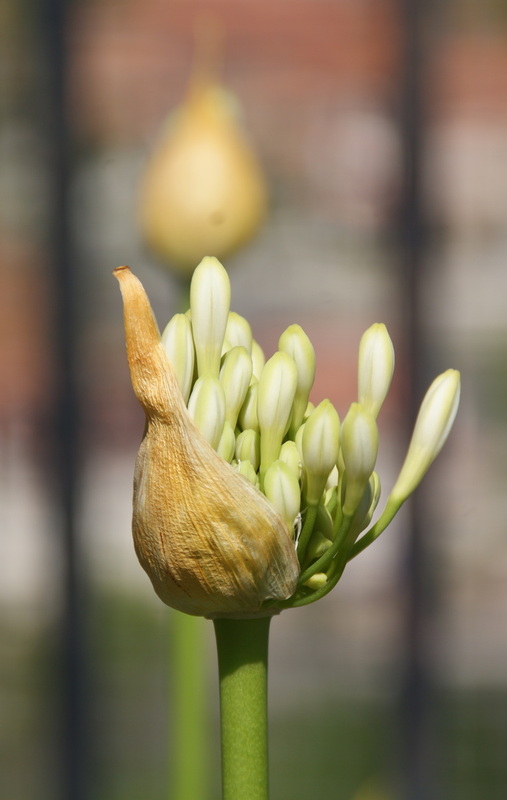 Here is the white agapanthus getting ready to bloom. 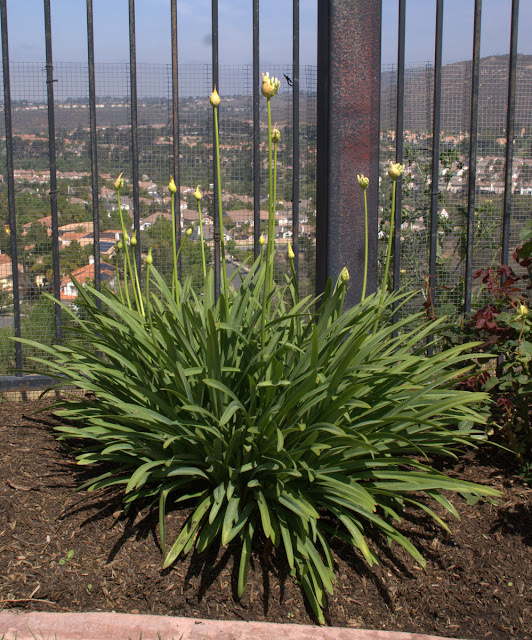 It has a good amount of flower stalks this year and it should be spectacular when all the blooms are open. Close-up of an agapanthus flower. ...as you can see if I get a little closer. The flowers of this rose are huge and they have a good form. Here I caught one bloom of 'Auckland Metro' with the camera that came close to perfection! I leave you with one more shot from a different angle of my White Garden Bed. Hope you enjoyed this entry. 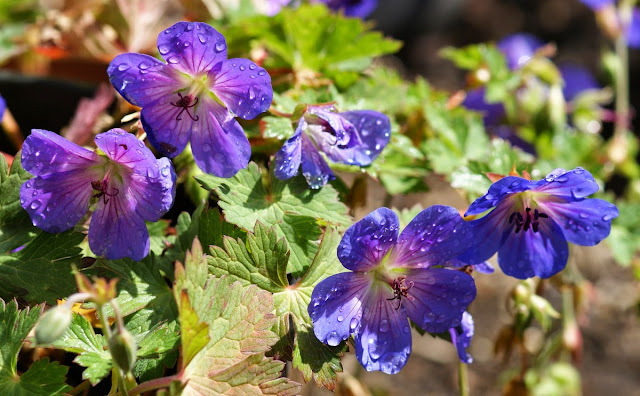 Please do pop over to Helen from the Patient Gardener's Weblog, who kindly hosts this great End of the Month View meme and take a peek at what other gardens look like by the end of May. I would like to finish by extending a warm welcome to all my new followers. I am so glad you found me in the vast world of the internet and decided to visit me regularly! 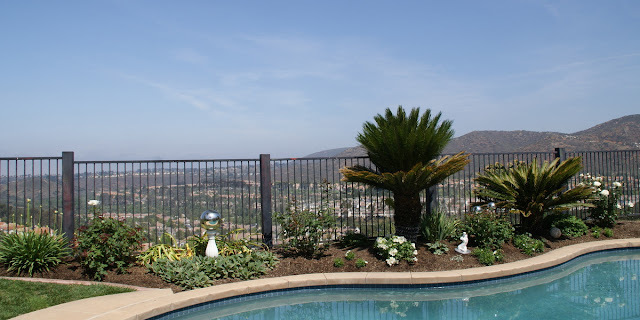 We were having an usual cool Memorial Day weekend here in San Diego (highest temperatures today were about 70 F/21 C and lowest temperatures predicted at 56 F/13 C) with mostly gray skies with very little sun and even a light drizzle from time to time, but unfortunately really not enough to water the plants. I worked on Saturday, but had yesterday and today off and got at least some gardening done, like planting my last white dianthus (how many dianthus can one plant?) 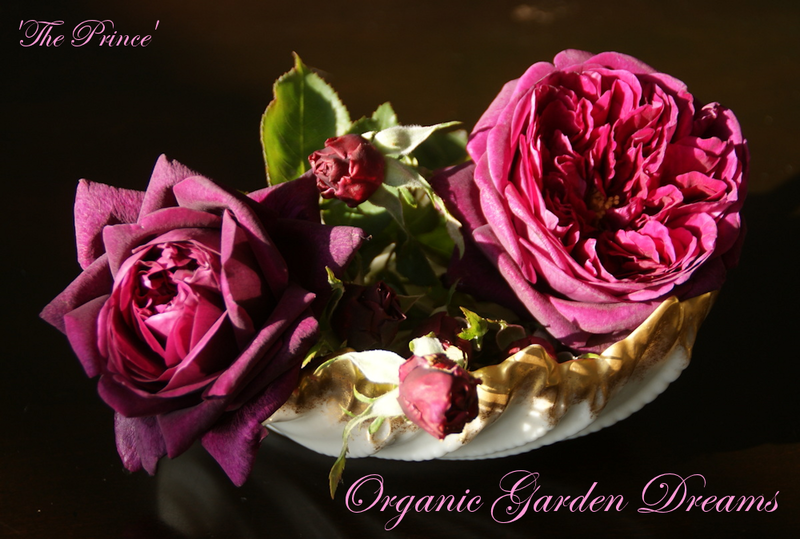 and finally fertilized all roses in containers on the terrace for the first time this year. I know that is way too late, but hey, nobody is perfect. I also weeded and cleaned out the Calla Lilies of spent flowers and yellow leaves. Since the weather was bad I didn't take any pictures this weekend, but was going over photos from the last weeks and would like to show you some of those tonight. The decent rains that we were getting lately did wonders to the garden. 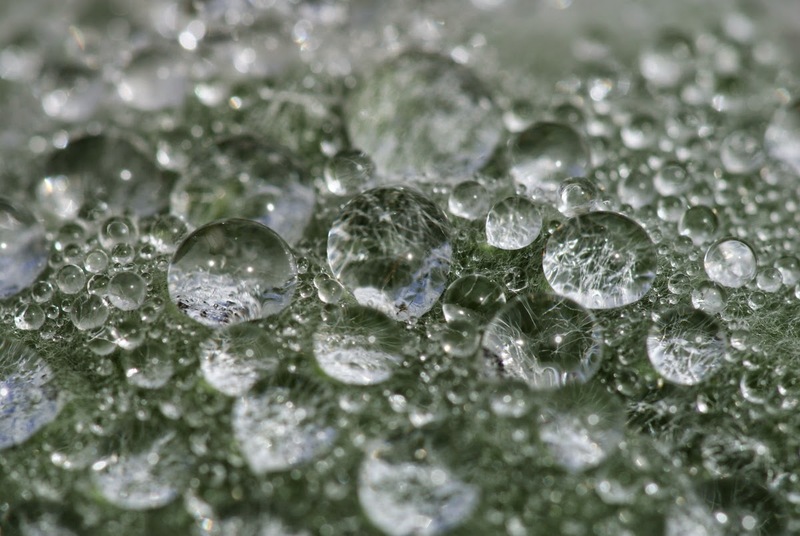 And the rain drops look beautifully on some of the plants. 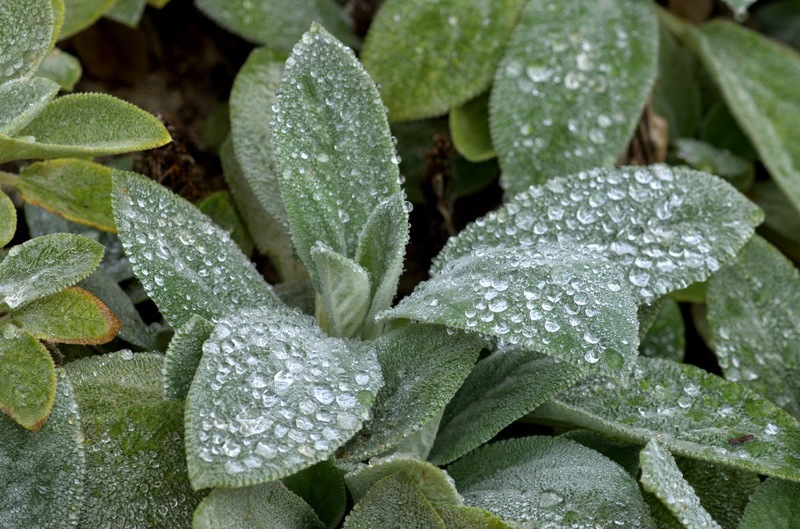 Here is a photo of Stachys ‘Helene von Stein’, more commonly known as Lamb's Ear. Close-up shot of Stachys 'Helene Von Stein'. Don't the rain drops remind you of diamonds? Who needs real diamonds when you can have something like this for free? Zooming in even closer. Nature is simply fascinating! 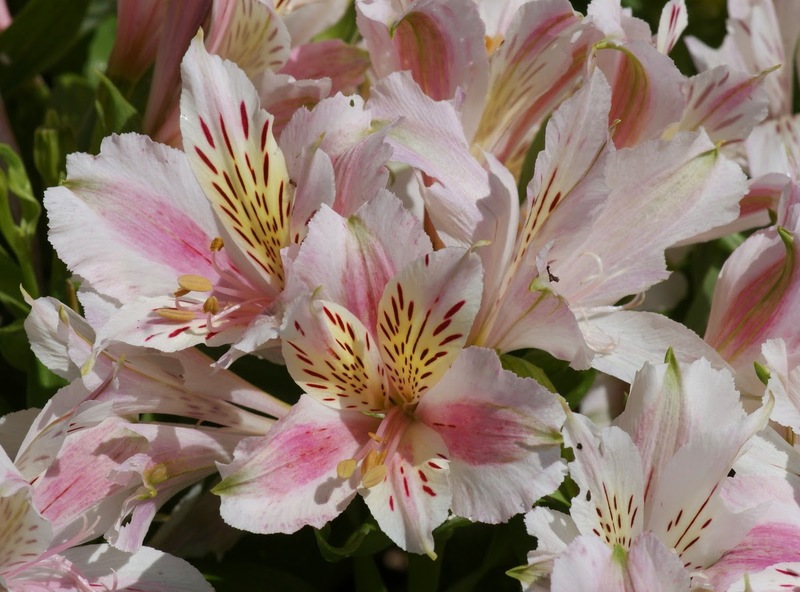 My second alstroemeria 'Little Miss Sophie' has finally bloomed, after giving her plenty of fertilizer. I think it is such a pretty variety and the best thing is, that the flower stalks don't flop over, because they stay short and don't become leggy like so many other varieties do. I didn't have too many blooms on my Calla Lilies, zantedeschia aethiopica, but the ones that I got were lovely. 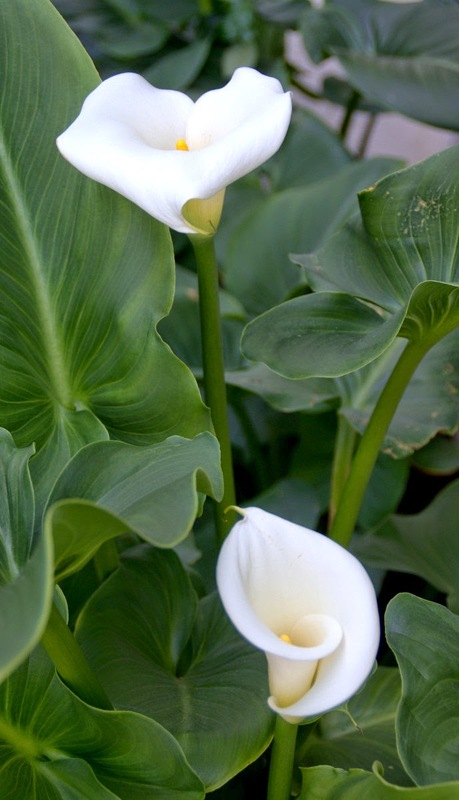 Unfortunately, Calla Lilies are anything but drought tolerant, so their future in my garden is uncertain. 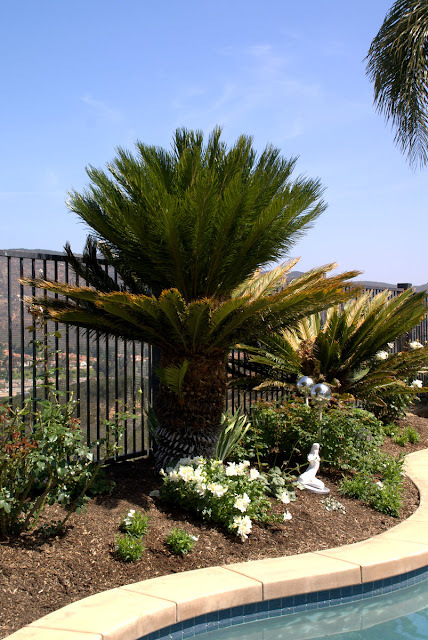 I went to the spring garden tour of the San Diego Horticultural Society. Besides the gardens that could be visited they had a big market place where many vendors were selling plants and garden related items. I came late and things were pretty much picked over, but these two beauties immediately caught my eye and I managed to get a hold of them. As far as I remember the vendor told me that they are miniature pelargoniums and he claimed to have bred these plants himself. This one is called 'Linda Zee'. I really love the cheerful little flowers. Usually the color of the flowers would be a little bit too bright for my taste, but somehow it didn't bothered me at all. As a matter of fact I really find them quite charming exactly how they are. The other one 'Cornelia O Plume' picks up exactly the color hues of a regular size Martha Washington pelargonium that I already have in my garden. I think these two are just the perfect addition to my small collection of pelargoniums. Now I just have to find a good place in the garden for both of them. To my knowledge coleus are annuals, but I cut mine (coleus 'Wasabi') back hard in winter anyway and to my surprise it came back just fine. It actually stayed more compact so far than last year, which I like even better. The chartreuse color of the variety is just perfect! 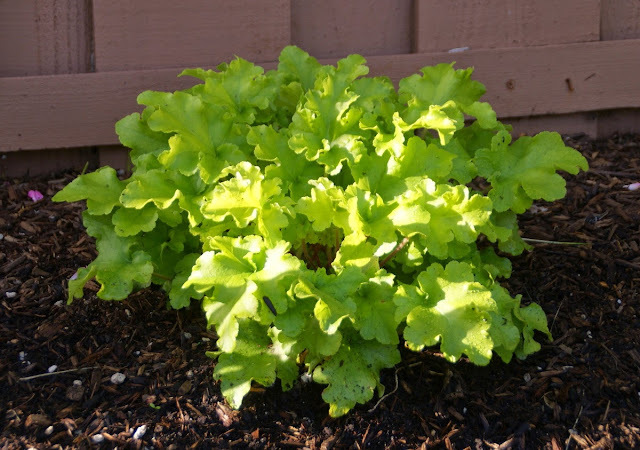 My recently bought heucheras 'Lime Marmelade' got planted into the ground in close proximity to the chartreuse coleus mentioned above and are doing fine. 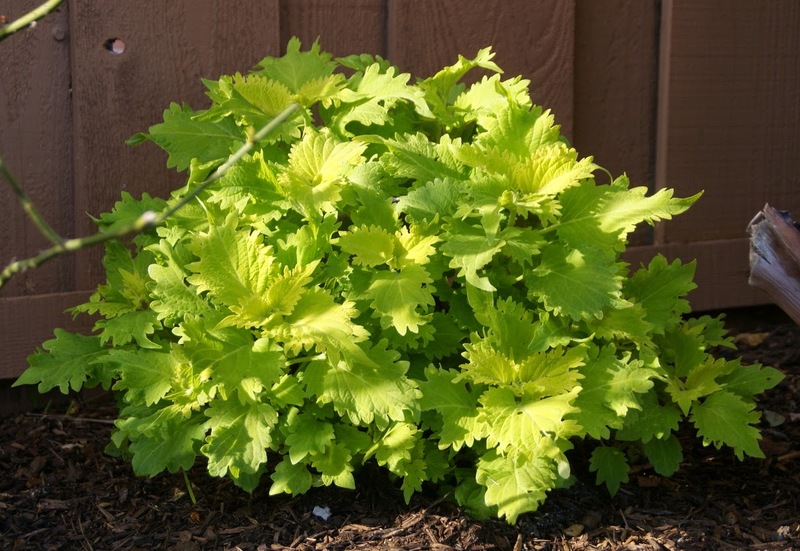 For a heuchera you can call them almost vigorous, which is rare in my climate. And so far they hold their chartreuse color well, just as the label promised. My white flowering bell flowers (unfortunately I lost the label with the name of the variety) are blooming for the first time since three years and have formed a nice ground cover around one of my Pygmy Date Palms. I believe that this is due to the winter rains that we got. For many of you maybe not so special, but I just love the dainty white blooms. First open bloom on my dark violet gladiolus (sorry, I have lost the label of this variety, too). 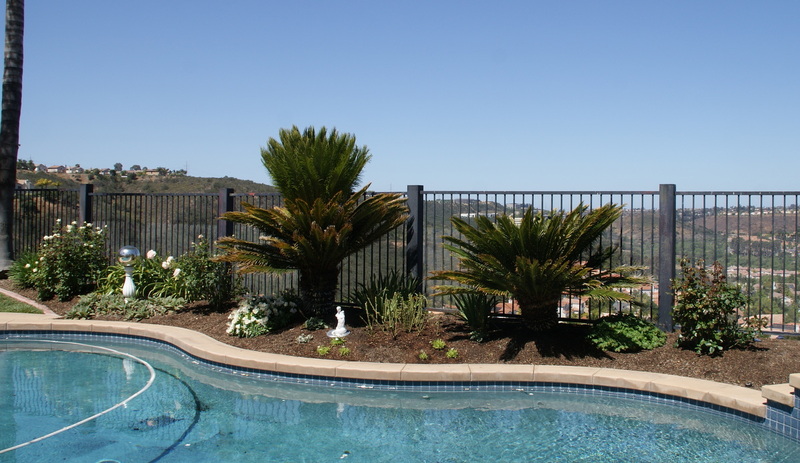 A few days later the plants looked like this. 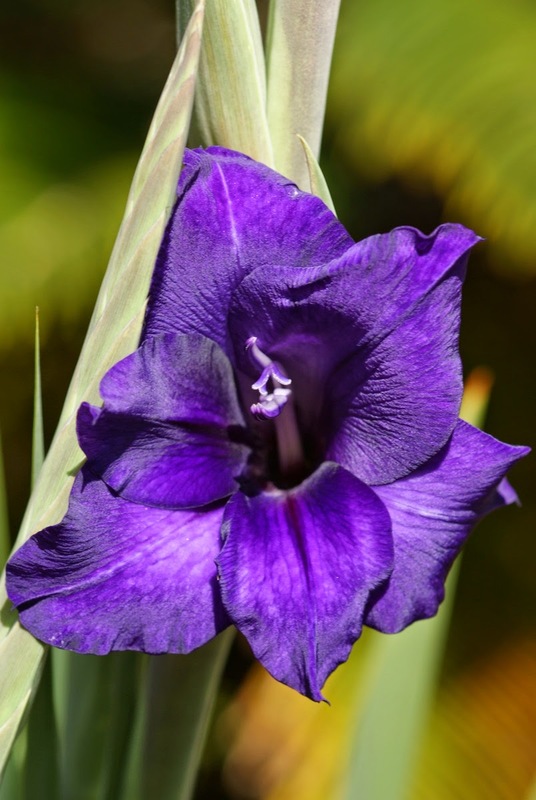 Gladiolus offer only a short show in my climate, but they are totally worth growing in my opinion. My 'Iceberg' beaming in the morning sun! Hardy geranium 'Rozanne' seem to be even more blue after the rain. 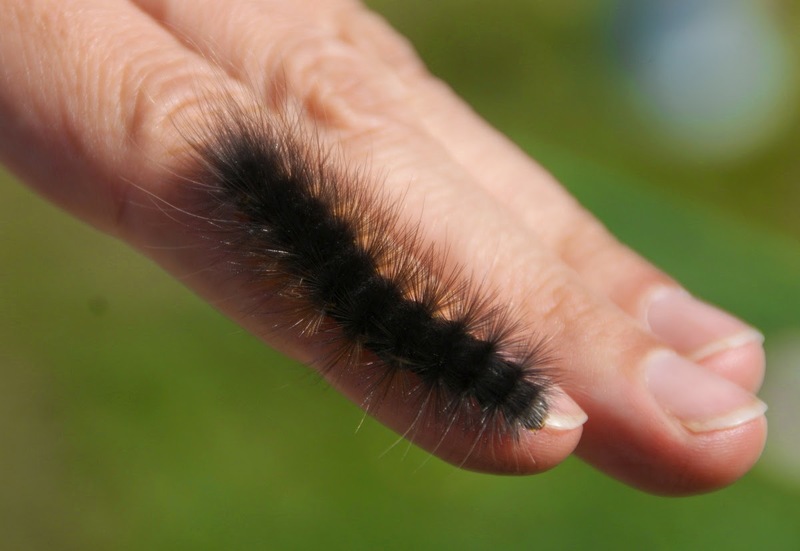 And now we come to the caterpillar. 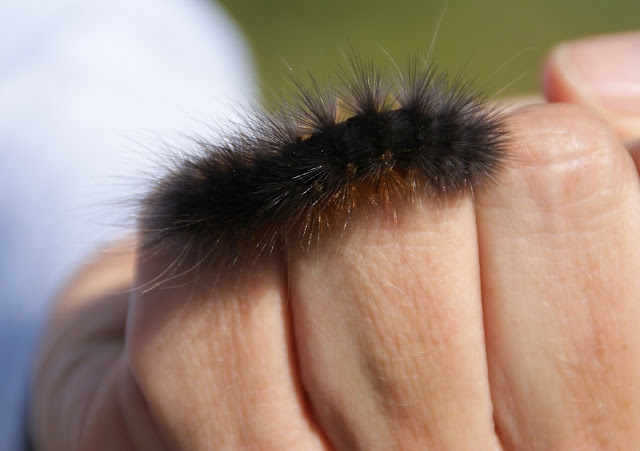 I found two of these hairy fellows in my garden. 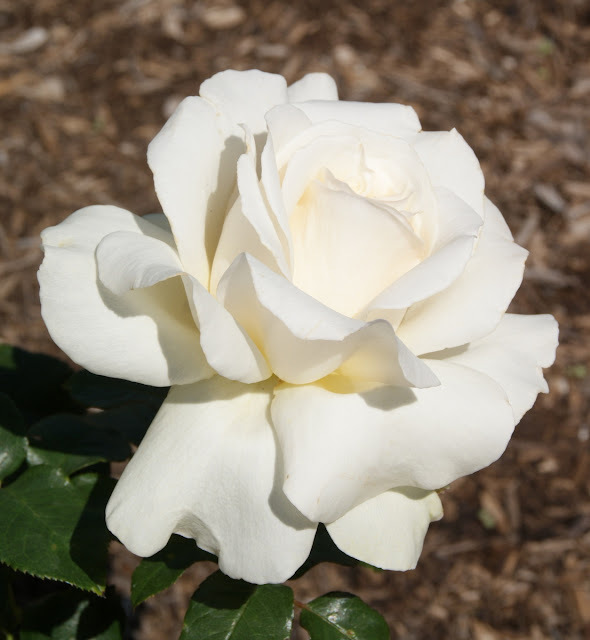 One was happily munching the petals of my white Hybrid Tea 'Pope John Paul II' and therefore needed to be provided with another food source outside of my garden! 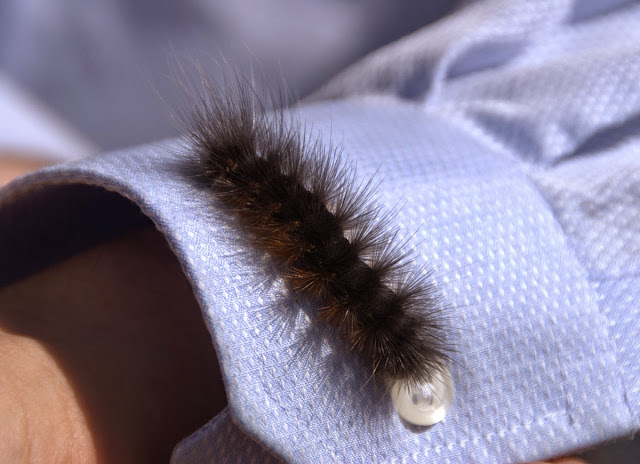 For a better size idea we put him on the cuff of my husband's shirt. ...and fingers. 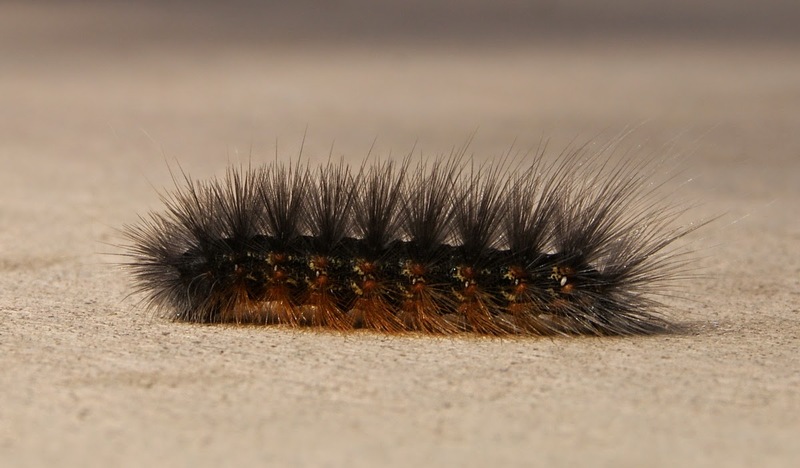 My husband tried to identify him but no luck so far. Does anyone of you have an idea what the name of this guy is? Does he become a butterfly or a moth? 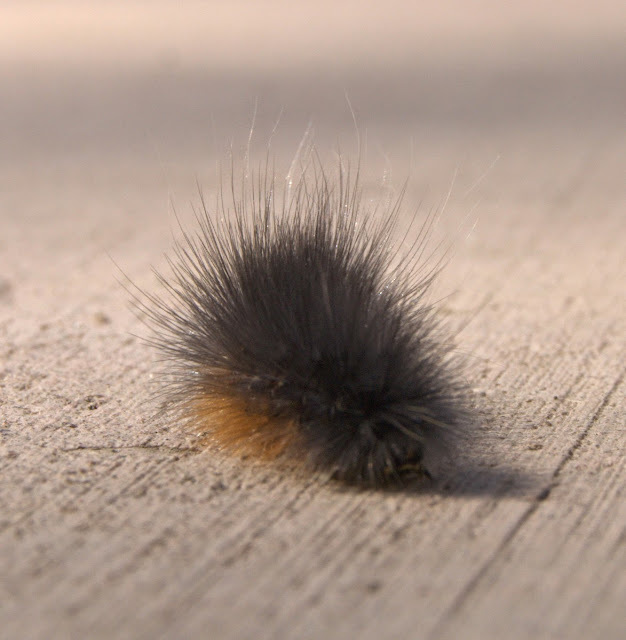 Always interested in trying out tech things my husband put his Iphone on the concrete of our terrace and took this slowmo video of the caterpillar. At the beginning and end you see the real time speed of this little guy. I think he was impressively fast. Just want to mention at the end that recently I passed 250.000 pageviews. That is a quarter million clicks on my blog! I find this a mind boggling number considering that I am not blogging that often. Thank you all for visiting and reading my blog, you made my day! April is usually a wonderful month for rose lovers in San Diego. The main rose spring flush happens around the second week of April and rose growing has been very fairly easy here so far. Except this year, at least in my organic, no-spray garden. 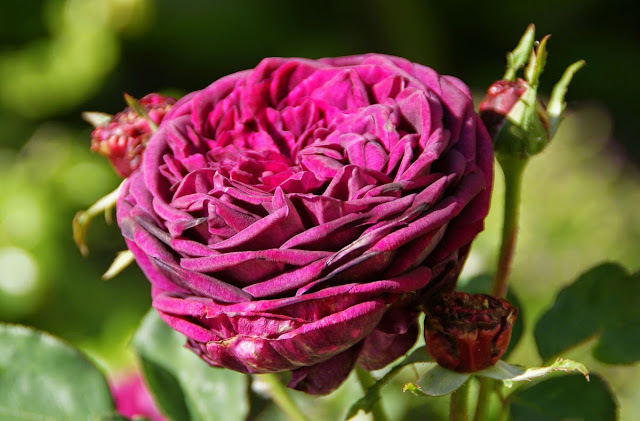 I had major problems with rust, powdery mildew and thrips last month and on some roses the whole spring flush was ruined. Others were soldering on no matter what. I suspect, that four years of drought and heat, plus the recently imposed mandatory water restrictions have finally taken a toll on my roses, but I refuse to be bogged down by that. 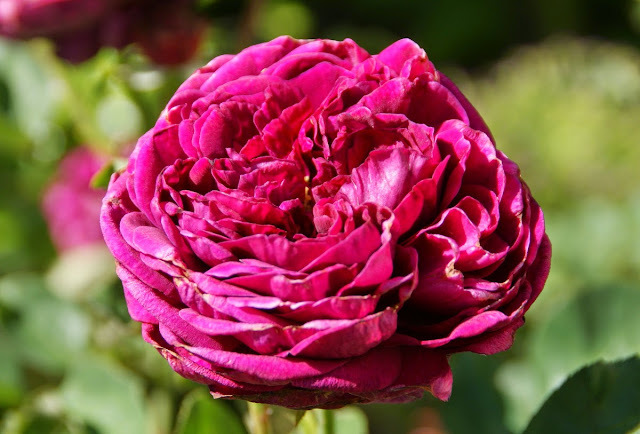 I will focus on the rose varieties that will still survive and maybe even thrive under the current conditions and find out by try and error which roses that will be. 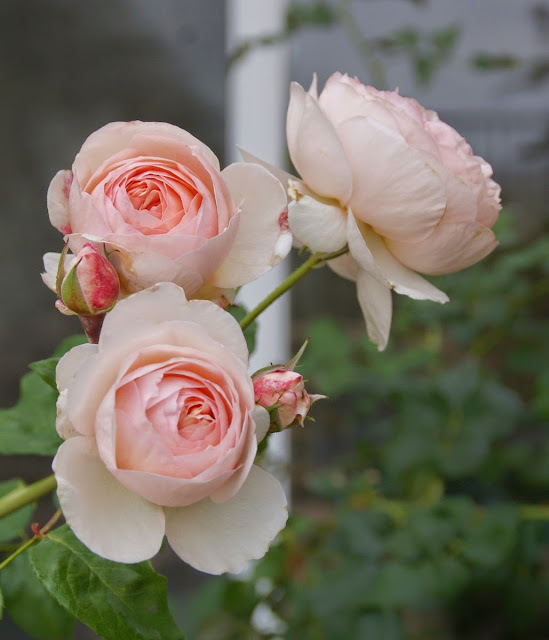 Maybe the ones of you, who are also garden in hot, arid and dry conditions can benefit from my experiences and I would be happy if you would share yours by making comments about which rose varieties do well for you in your garden. I am starting out with a photo of a cluster of 'Heritage', a David Austin rose, that I planted into the ground about two years ago. The blooms of this rose can be incredible beautiful as this picture shows,..
..., but they shatter very quickly, when it is hot, sometimes within a day or two. 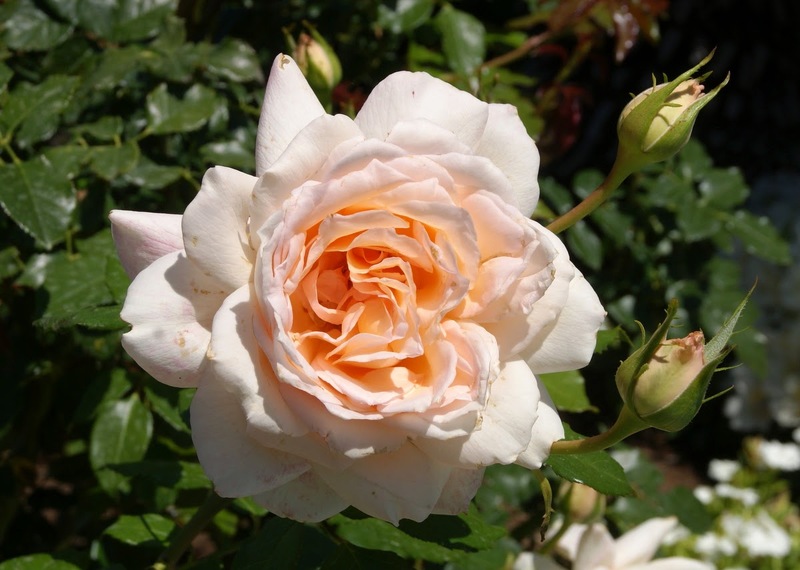 The bush itself wants to be lanky and big and the rose suffers from powdery mildew and rust. Thrips have been a problem this spring as well, but not to the degree other roses got molested. 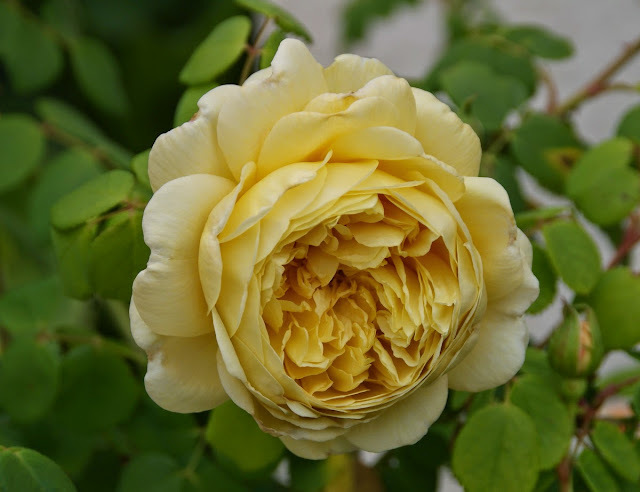 My conclusion so far is that despite the wonderful blooms I wouldn't recommend this rose for a similar climate based on the problems mentioned above. I most likely will give mine one more year, but if it doesn't improve it may have to make room for another contender. 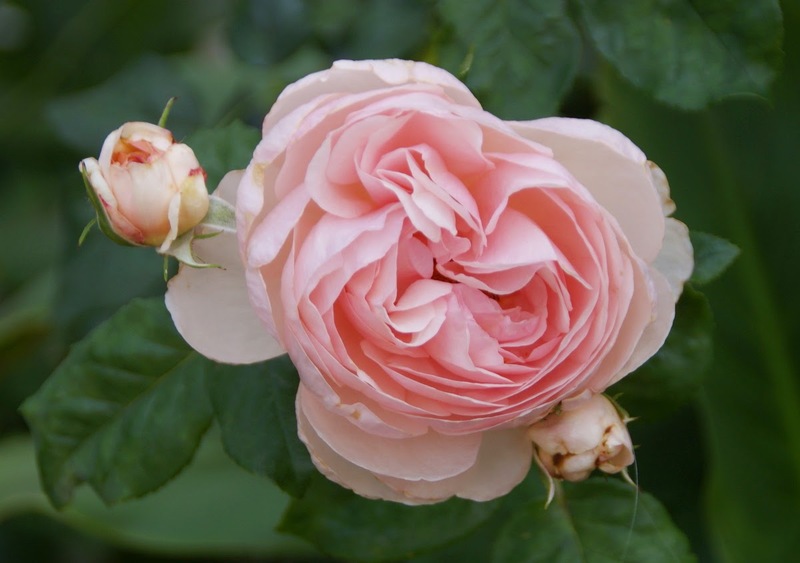 The rose above is 'Pretty Jessica', another of David Austin's creations. Surprisingly this rose has been its best ever this year. Partly that might be due to the fact that I was fertilizing the rose more generously, which seems to be necessary because of the palm root competition that it has to put up with. 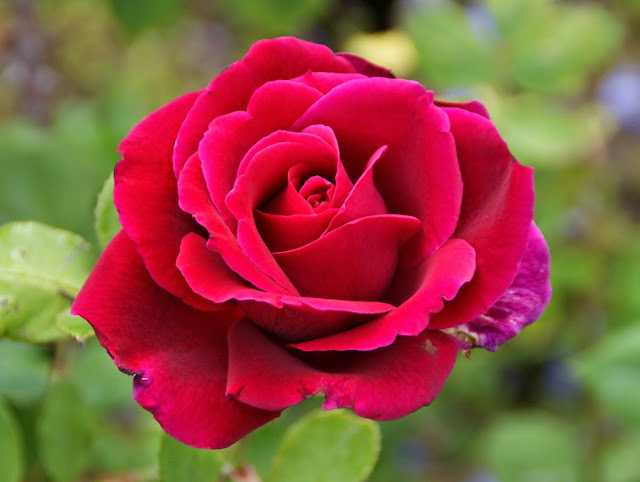 The rose is planted in more shade than roses usually like, but despite of this, it is totally healthy. As far as I can see by now, this is a great rose for my climate. Another thing that 'Pretty Jessica' has going for it is that the size stays manageable (2 - 3 feet/ 60 - 90 cm), which can't not be said of many David Austin roses in my climate. 'Mister Lincoln' is an old standby in my area. 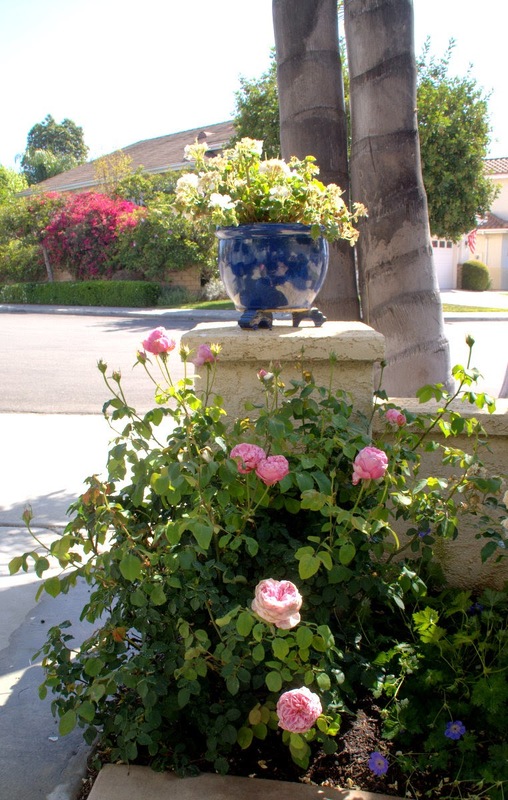 This rose likes a warm climate (but maybe not as hot as it has been here in the recent years) and flowers reliably. The fragrance is absolutely wonderful on this variety. As you can see in the photo above when it gets too hot the rose petals fry, but on days where very high temperatures are forecasted I simply cut the flowers for indoors and therefore don't mind too much. 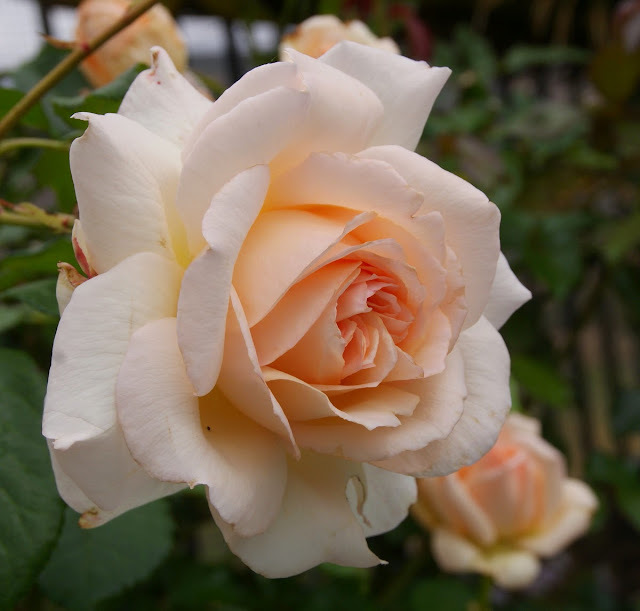 The flower shape can be very classical Hybrid Tea and if you like that, this rose may appeal to you. I can't say too much about the bush form since my rose is still growing in a five gallon container, which of course doesn't allow the rose to fully develop. Disease resistance seems to be OK so far. 'Nimbus' is coming up with the most interesting and pleasing brownish-pinkish hues on warm days. This rose is also suffering from powdery mildew, but its ability to bloom doesn't seem to be too much affected by that. I caught a couple of blooms of 'The Prince' with the camera last month. This rose is not doing well this year. 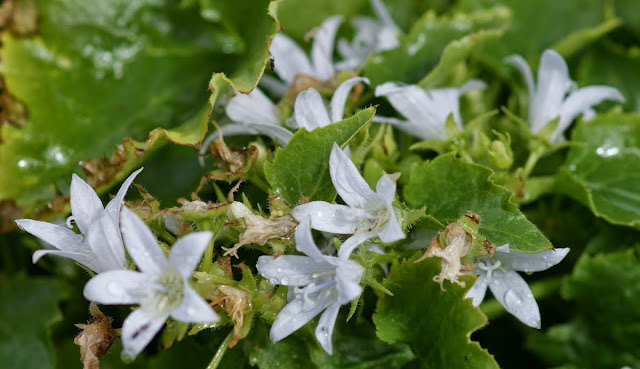 It suffers from powdery mildew and the blooms fry very easily in high heat. 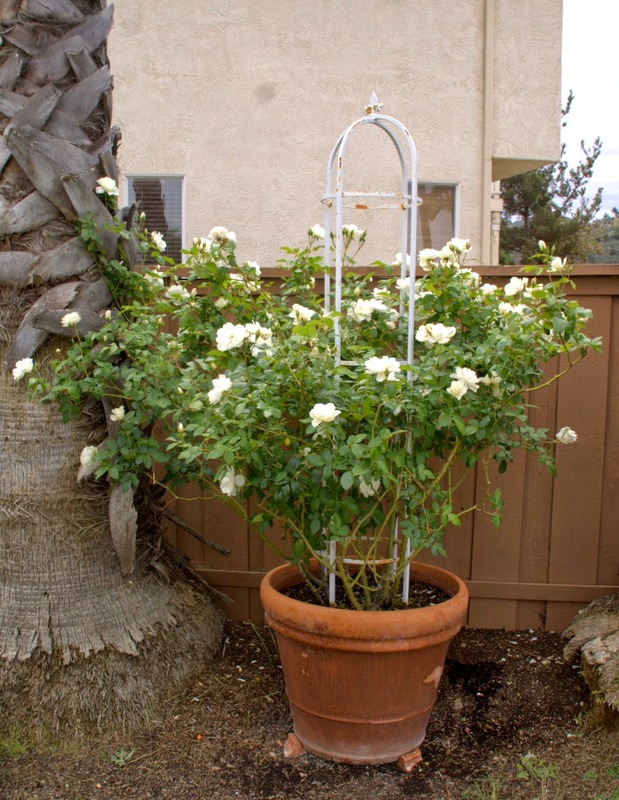 The rose is approximately in its second year in the ground and has started to become a tall but narrow bush. 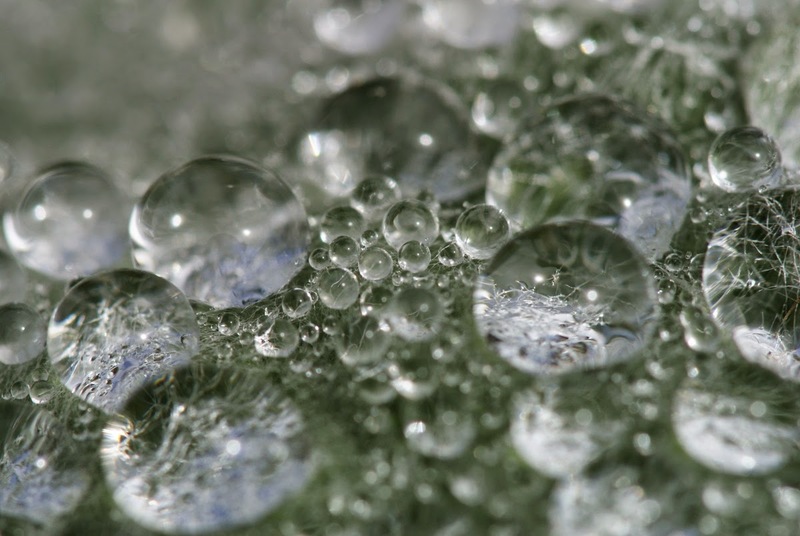 The plant itself is not necessarily a pretty sight! 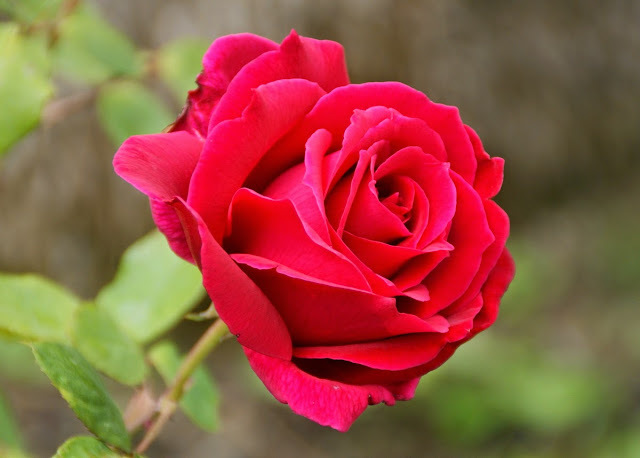 But when the blooms of this rose are good, then they are outstandingly beautiful and for that reason it will stay at least one more year with me. 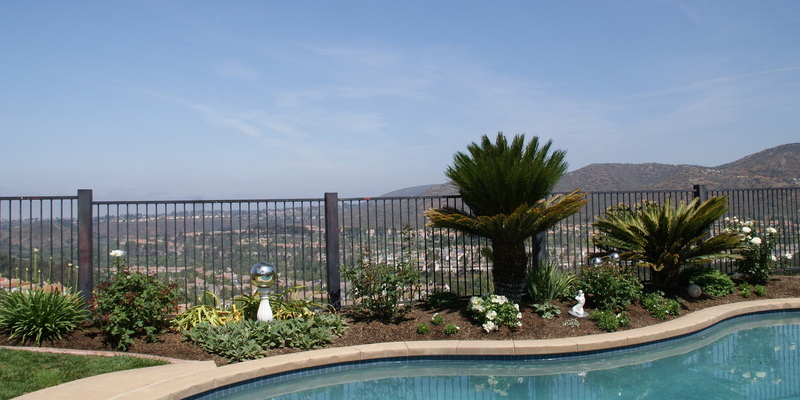 'Iceberg' is another old standby in Southern California. This variety is often planted at gas stations or integrated into the landscaping of shopping malls, which indicates how little care it needs to do well. 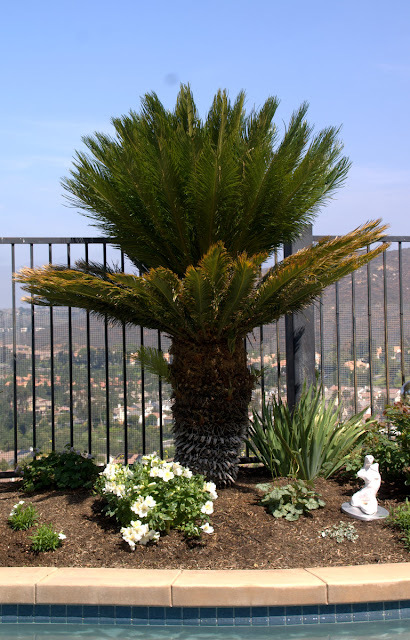 Mine is planted in a big terracotta container, which I positioned between two huge Washingtonia Palms, because anything planted into the ground there would be just suffocated by the beastly palm roots. 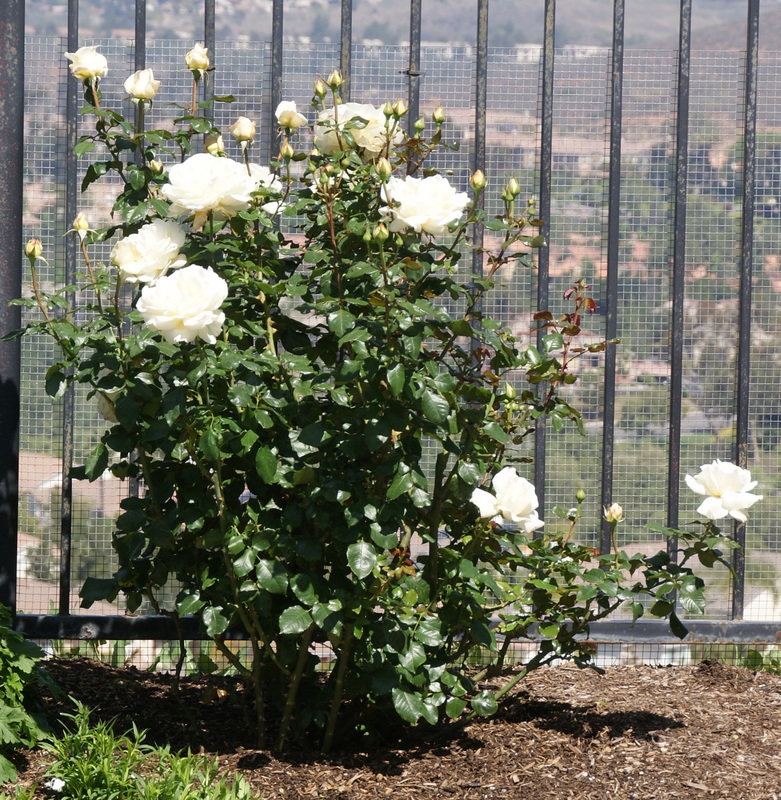 My 'Iceberg' rose isn't even fertilized this year (bad gardener, I know! ), but still managed to churn out a nice flush. 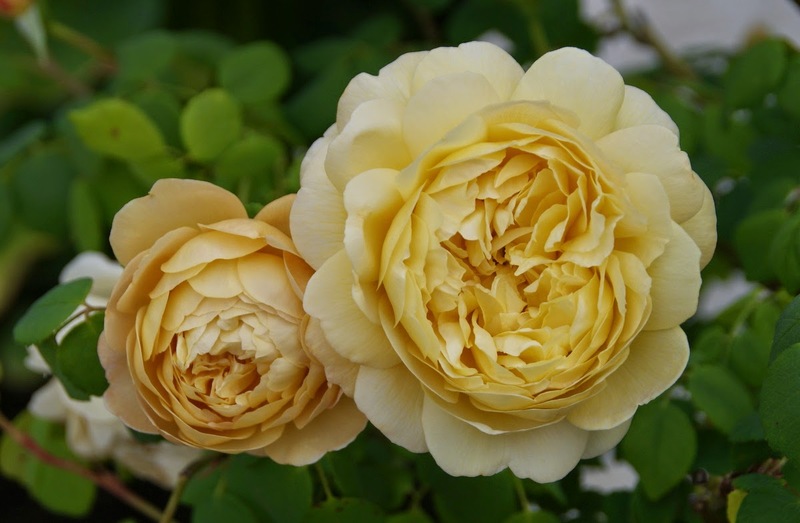 'Chandos Beauty' is a relatively new rose to me so I haven't made up my judgement, yet. The blooms can be absolutely gorgeous and they are of a humongous size. Fragrance is very strong on this variety. The plant got very lanky last year, but this year it seems to stay more bushy and mannerly. This dainty little pink rose, which here is forming a posy just naturally by itself together with salvia 'Mystric Spires Blue', is called 'Pink Pet'. 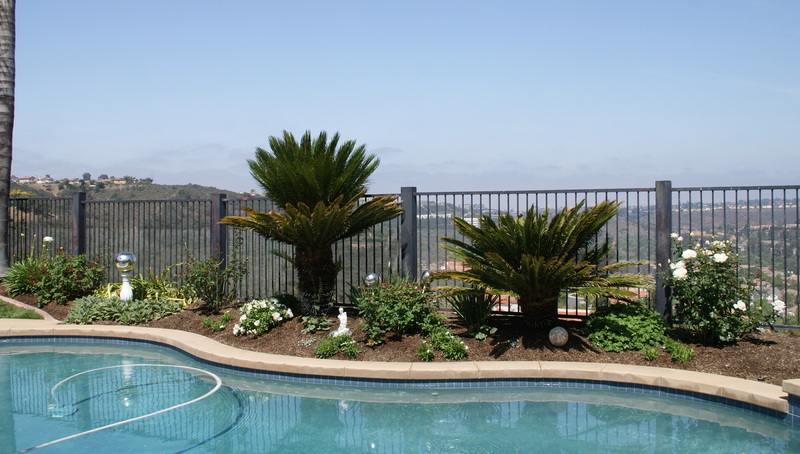 I like it very much and the plant is completely healthy in my climate, but the fragile blooms fry easily in the heat. I have two plants of 'Charles Darwin' growing in containers to the right and left side of my kitchen door, which leads to the backyard. 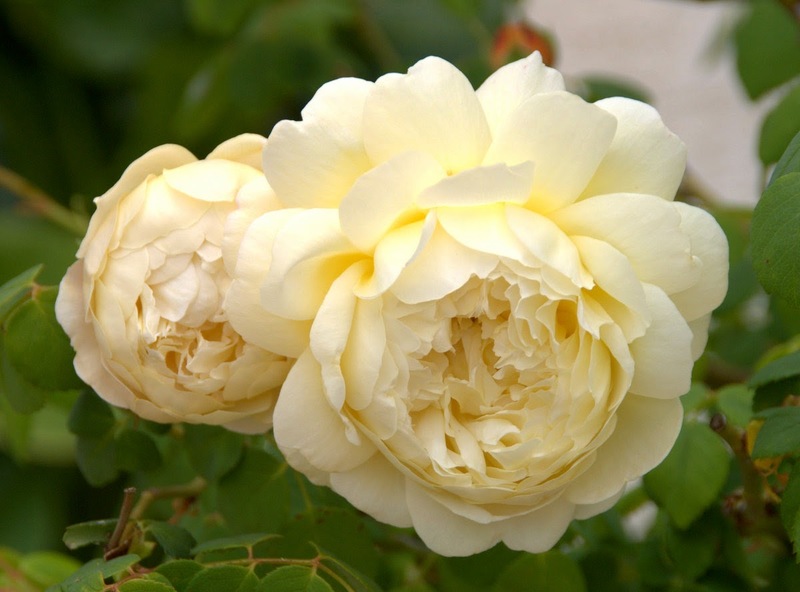 ...which fades out to a light pale yellow as the blooms age. 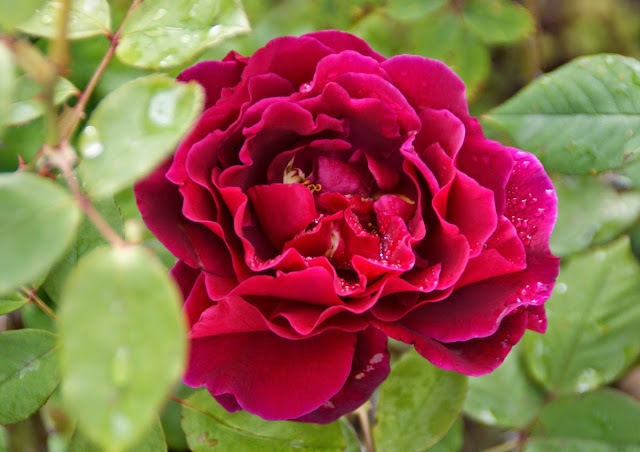 This rose is definitively one that I would recommend for my climate. 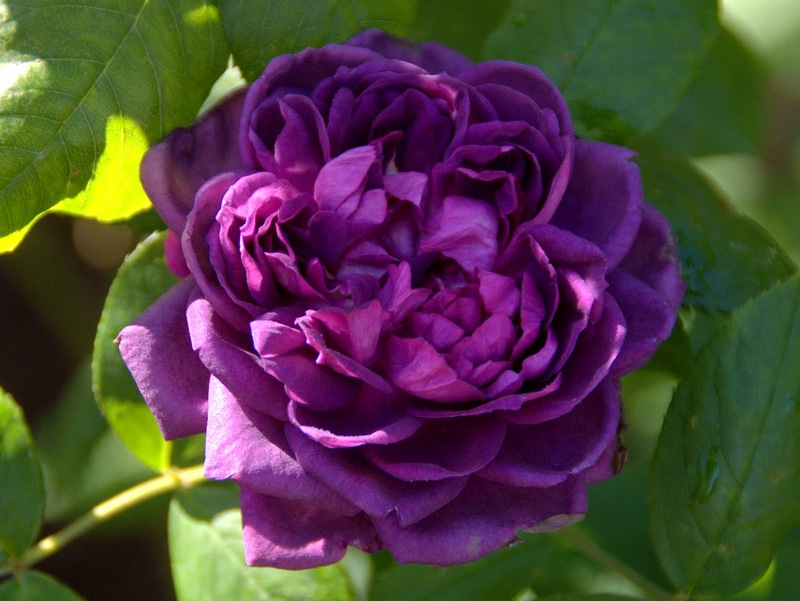 ...but when the conditions are right it can grace you with these amazing violet rose flowers. 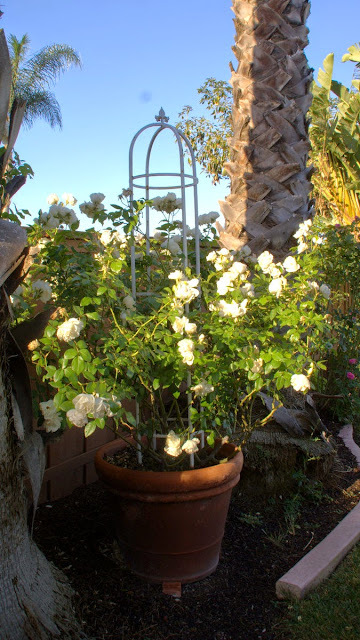 I hope you enjoyed seeing some of the roses that bloomed in April for me in my garden. This May the weather has been cooler than in the previous years and we even had some rain. You can imagine that the roses responded very well to this, but that will be the topic of the next May Roses post. Wishing you lovely spring weather, wherever you are.